Brahmaputra Valley Fertilizer Corporation Ltd (BVFCL) Recruitment 2018 Sept | various post :- Brahmaputra Valley Fertilizer Corporation Ltd . which is a CPSE under the Ministry of Chemicals & Fertilizers has issued a vacancy notification recently in the month of September 2018. 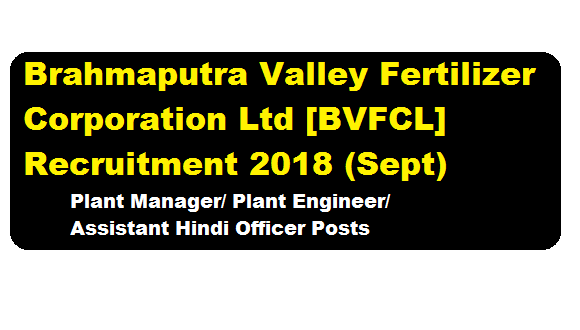 According to the latest BVFCL Recruitment 2018 September , Brahmaputra Valley Fertilizer Corporation Limited invites applications from Indian nationals for the posts of Plant Manager, Plant Engineer & Assistant Hindi Officer. The details of the recruitment can be found below. In this section, we will discuss in details about the recruitment of Various Posts under Brahmaputra Valley Fertilizer Corporation Limited Recruitment 2018 with vacancy details, eligibility criteria, salary with other details and requirement. Educational Qualification: Candidates must have Graduate Degree in Chemical Engineering with minimum 8 years post qualification Executive experience in line in a PSU/ large Private sector Chemical Industry. Educational Qualification: Candidates must have a Graduate Degree in Instrumentation/ Electronics Engineering with minimum 8 years post qualification Executive experience in line in a PSU/a large Private sector Chemical Industry. Preference will be given to candidates having in line experience in Fertilizer & Chemical Industries. Educational Qualification: Candidates must have done Master’s Degree in Hindi with English as core subject at Graduation level from recognized University with minimum three (03) years experience of terminological work/ translation work / teaching/research/journalism in Hindi. Should have through knowledge of the Official language Act. Interested and eligible candidates may apply in prescribed format along with attested copies of certificates and testimonials regarding age, qualification, experience, caste for SC/ST & valid non creamy layer certificate for OBC, Disability certificate for PwBD candidates from Competent Authority, two recent passport size photographs and a non-refundable application fee of Rs 200/- (Rupees two hundred only) for candidates belonging to General and OBC category only by way of Bank draft drawn in favour of BVFCL, Namrup payable at SBI/UCO Bank, at Namrup, Assam-786623. SC/ST/PwBD/Ex-SM candidates are exempted from payment of application fees provided they attach an attested copy of SC/ST/PH certificate as applicable, issued by the Competent Authority along with their application. 1) Essential qualifications as specified must be from UGC recognized University/Deemed University or AICTE/ approved Autonomous Institution. 2) Reservation of post /relaxation in age etc. as applicable for SC/ST/OBC (non creamy layer)/PwBD and Ex- Serviceman candidates shall be as per the Government of India directives. 4) For claiming the benefit of PwBD, the candidates should produce Medical Certificate issued by a Medical Board attached to the special Employment Exchange/Vocational Rehabilitation Centre for PH or Head of concerned Department of a Government Civil Hospital satisfying the prescribed disability criteria. 5) BVFCL reserves the right to relax the age criteria in case of highly deserving candidates, offer immediate lower posts in case candidates are not found suitable for the advertised/applied post. 6) Candidates employed in Govt. Department/Public Sector Undertaking/ Autonomous bodies shall either forward their application through proper channel or shall produce “No objection certificate” from their present employer at the time of interview. 7) Applications not found as per prescribed format will be summarily rejected. An application not accompanied by relevant certificate(s)/document(s)/photographs etc wherever necessary or requisite fee or not in prescribed format or not signed by the candidate or incomplete in any respect will not be entertained. 8) Applications received after last date of submission will neither be entertained nor returned. BVFCL will not be responsible for postal delay or loss/ non delivery thereof. No correspondence in this regard will be entertained.